Make any sound your own and build your own unique sample library! Learn the expert techniques used by sampling professionals in this incredible technique-packed tutorial. 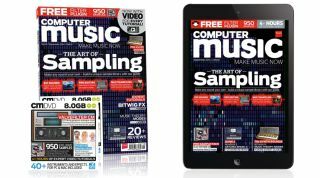 See it all with close to THREE HOURS of video dedicated to The Art of Sampling! Steal a kick drum from a full track and use it in your own music! Crate Diggers' Delight: Treat your ears to 800MB+ of exclusive hits and loops, all dripping with a classic old-school sampled vibe. Download these sounds right away when you get CM207! How do you get the most out of your audio interface? And indeed, how do you choose which one to get? Our guide makes it easy - we've even prepared videos on optimising latency and setting up an interface's mixer software. Modes? No more mystery! Take the confusion out of musical scales once and for all with our clear, step-by-step tutorial and video. You'll get a grip on Phyrgian, Mixolydian, Aeolian and all the rest of 'em - power up your knowledge today and make better tunes right away.